After learning Send email with Attachment using PHP Mailer, now in this post we have discuss how to send email with attachment in Codeigniter. Because we all know Codeigniter is robust framework for developing any web application and it has it's own Email library for send an email from application. So, here we have seen Codeigniter send email using SMTP with file attachment. This is MVC framework, so here we have to create two file like Controllers and Views. Controller files will received request from browser and it will send request to view file and view file will display output on browser. That means first times when controller will load in browser then it will called index method and in that method it will load view file. After this user will fill view file form and click on submit button then view file will send request to controller method and in that there has been two process has been done. 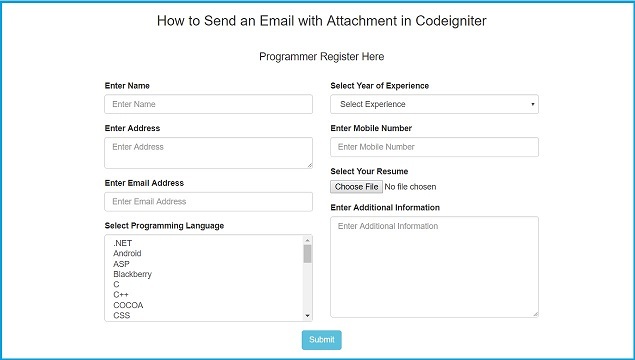 Because Codeigniter Send Email with Attachment, for this first we have to know how to upload file in Codeigniter. For Attach file with email send in Codeigniter we have to first upload file to folder then after we can attachment file with mail. For this topic like send html email in Codeigniter with attachment we have use two library like Email and Upload of Codeigniter. File will be uploaded by using upload library and email send with attachment has been use email library. For attach uploaded file with email here we have use attach() method of email library. We all know send email from web application is required feature of any web application. And Sometime with email file attachment is also required. So here we have make this tutorial on Codeigniter Send Email with Attachment. Below you can find complete source code.